Tens of thousands of protesters marched on Rome this Saturday to denounce the austerity measures and economic reforms of Matteo Renzi’s new government and to restate their call for income, housing and dignity for all. Dozens were injured as clashes broke out towards the end of the march and police violently charged forward into the crowds, indiscriminately beating protesters and trampling over those who got caught in the way. What the police could not trample, however, was the resolve of the movements to step up their resistance in the wake of last October’s sollevazione generale (“general uprising”), which brought a hundred thousand people into the streets of Rome. Saturday’s events are particularly remarkable for two reasons: first of all, the Italian movements had been fairly lackluster in responding to the European debt crisis when it first broke in 2010-’11. 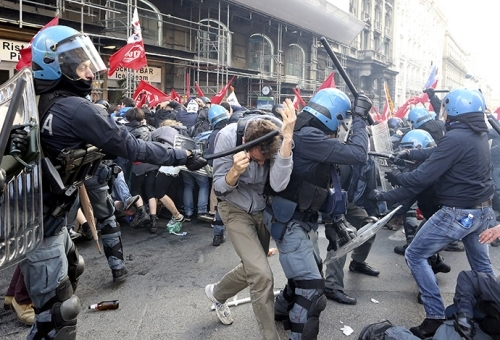 Apart from a massive demonstration in Rome on October 15, 2011, which quickly degenerated into tactless violence, the indignados-Occupy wave largely passed the country by, even as an unelected technocratic government headed by former Goldman Sachs adviser Mario Monti took power. This somewhat ambivalent recent history makes the ongoing mobilizations all the more important, especially since the housing and unemployment crises have deepened significantly since. The second reason we should be paying attention to Italy, however, strikes closer to home for most. Saturday’s protest occurred against a backdrop of relative demobilization across the rest of Europe and North America. Right when anti-austerity movements elsewhere appear to be on the retreat, the Italian movements are gradually stepping up their resistance. This raises an interesting question: do we have anything to learn from the grassroots processes currently underway in Italy? I believe the answer is yes — and I think we should be paying particular attention to the broad social composition and the “common project” that underpin these grassroots processes. But let’s first take a step back. Last week, I briefly touched upon a number of challenges that the international movements face in their current phase of relative demobilization. I proposed that some of the main reasons for the “lack of protest” nowadays have to do with (1) the social atomicity induced by the increasingly precarious nature of work in the crisis and under financialized capitalism more generally; (2) the isolating effects of anxiety generated by neoliberalism’s demands for constant connectivity and permanent productivity, combined with police repression and the aforementioned rise of precarity; (3) the overwhelming sense of futility experienced by large parts of the population. To these factors, one reader rightly added the mental and physical exhaustion stemming from unsustainable forms of activism. Now if movements elsewhere are interested in revamping the resistance, I believe they will have to find ways to directly target these interrelated factors — and the Italian movements may provide us with at least one clue on where to start: by sitting down together and carefully spelling out a common project behind which disparate political groups, autonomous movements and isolated individuals can unite. What is needed is a single banner capable of sustaining a broad popular coalition behind a set of shared aims and principles. In Italy, this project is referred to as una sola grande opera: casa e reddito per tutti – “only one big endeavor: housing and income for all.” This project in turn builds on a decade of local experience in organizing around “the right to the common” (for a useful primer on the subject, check out this talk by Michael Hardt). The concept of the common has been gaining popularity in activist circles around the world in recent years, but it is perhaps being spelled out most explicitly in the cycle of struggles taking place in Italy right now. As my friend and fellow EUI researcher Alfredo Mazzamauro pointed out in an excellent article for ROAR earlier this year, the remarkable thing about the sollevazione generale of October 19, 2013 was precisely that it cut across the dividing lines that for so long have kept the Italian left and its social movements divided and fighting among themselves. It was largely through the identification of a common enemy (neoliberal capitalism) and the formulation of a common project (around income and housing) that these disparate groups were able to join forces and are now starting to craft an autonomous political strategy from below. That this narrative revolves fundamentally around housing and income is not a coincidence: 40% of Italy’s youth are now out of work and in 2013 alone some 68.000 families received eviction notices, 90% of whom because they had failed to pay their rent or mortgages as a result of insufficient income. But the rallying cry for income and housing is not just a moderate reformist plea in the face of a devastating crisis. When protesters in Rome call for the reddito, most are referring to unconditional basic income; and when they talk about housing they refer to it not just as a human right but as a common good. So the movements are not simply making a demand upon the government. Rather, they are restating a revolutionary aim to separate the human need for shelter and sustenance from the social dependence on wage labor and exchange. This constitutes a radical re-imagination of value in and of itself. The formulation of housing as a common good and income as a universal benefit therefore has the potential to greatly widen our political horizons. First of all, the notion of basic income shatters the exploitative idea that ordinary people should sell their labor power to some luckier human being (their employer) just to survive. It recognizes the fact that our societies (at least in Europe and North America) have accumulated more than enough capital over the ages to provide everyone with at least the basic necessities of a modest livelihood. And it provides a concrete alternative to combat the profound sense of anxiety wrought by labor precarity. Make no mistake: breaking down the dependence on wage labor for basic needs would have profoundly transformative implications for social relations and the nature of everyday life. Secondly, as David Harvey has repeatedly pointed out in recent years (including in his recent talk at the LSE), the notion of housing as a common good has similarly radical implications at the foundational level of the capitalist economy. By breaking down the contradiction between use value and exchange value, housing as common good recognizes the superior value of the basic need for shelter and security over the unproductive and entirely fictitious value of speculative investment in real estate. As such, it dispenses with the market fundamentalist idea that a house is first and foremost an exchange value; an utterly irrational conviction that has produced a world in which millions of homeless people now sit side-by-side with millions of peopleless homes. Similar broad coalitions briefly came into existence elsewhere in the course of 2011, but in most cases these coalitions could not be held together as they quickly extinguished their negative energy and mostly failed to articulate a shared vision and a concrete political project that protesters could positively commit to and continue to organize around. In the absence of such a common project, the coalitions of 2011 took, for the largest part, a rather ephemeral or transient form: a common enemy was identified (Mubarak, Wall Street, Erdoğan), but beyond the crucial re-invention of the popular assembly, few steps were taken to construct an alternative political imaginary and long-term revolutionary strategy. Developing such a common political project is not the same as cramming the multitude of social forces and political imaginaries into a single unified structure. Most importantly, it is not about crafting a political party out of the patchwork of social movements, as the more traditional leftists keep insisting we should do. Rather, the example of the Italian movements is instructive because it shows how various left-wing tendencies can successfully keep a coalition together while staying true to their own political convictions. Some elements within the movements are pursuing political work, organizing themselves into parties (whether pre-existing or new), while other elements stress their autonomy (whether moderate or radical) from the political system, focusing instead on building alternative institutions from the grassroots up. In this respect, it should again be stressed that a common project is not the same as a political program. To call for housing and income for everyone is not the same as demanding housing and income for everyone. Few of the protesters in Rome would be naive enough to believe that Renzi’s government would ever implement such radical demands in the first place. This is why diversity of tactics remains very important: to realize both immediate and long-term objectives, the movements will have to be strategically determined but tactically flexible. Direct action by the squatting movement, for instance, is already freeing up living space for people who have been evicted from their homes and who cannot afford to wait for future reform or revolution. Meanwhile, the more long-term organizing of other groups may lay the groundwork for larger-scale victories through more established channels, as happened with the movements’ resounding victory in the 2011 referendums, in which the Italian people overwhelmingly rejected the privatization of water — another common good. Diversity of tactics also means that the more militant activists should not endanger the safety and well-being of peaceful demonstrators (as they did during the self-defeating militant actions of October 15, 2011), while the pacifists within the movement should at the same time allow space for militant action and more confrontational tactics. In Italy, this informal establishment of a diversity of tactics within the broader coalition of social forces has led to an interesting reversal. In October 2011, militant protesters were recklessly drawing peaceful protesters into violent clashes with police while peaceful protesters were shamelessly arresting militant activists and turning them over to the same policemen. In October 2013, by contrast, militant protesters stood their ground at the Ministry of the Economy and protected the peaceful majority from police assault. The next day, the peaceful majority aligned behind the more militant elements to demand the release of six activists who had been arrested during the clashes. This is how a movement closes its ranks and effectively disarms the divide-and-rule tactics of the state’s ideological and repressive apparatus. Needless to say, each movement arises in its own particular context and will therefore need to devise its own particular narratives, tactics and strategies in order to build broad coalitions around the common good. There are promising signs that this is already starting to happen in some places. In Europe and North America, the Spanish movements are probably most advanced in this respect. Take the inspiring example of the Platform of Mortgage Victims (PAH), which brings together weathered activists and lawyers with migrants, workers and the unemployed, and which combines direct action (blocking home foreclosures, occupying bank offices and organizing escraches in front of politicians’ homes) with more traditional pressure tactics to repeal anti-social laws or pass legislation in defense of homeowners. At the same time, the PAH works in close cooperation with other groups and movements within the various national coordinadoras. Like the “one big project” in Italy, PAH proposes to treat housing as a human right and a common good, and similarly calls for a basic income. In North America and other European countries, similar coalitions are possible, as long as activists manage to identify the common causes that can be leveraged in order to bring together disparate groups of people who otherwise would not speak the same political language and who would not be very inclined to work together. The trick is to identify the weak spots of the system and pinpoint the everyday grievances that lie at the root of our social ills and at the basis of the day-to-day reproduction of capitalism. This would allow the movements to challenge the system’s foundational power relations through highly targeted interventions whose impacts can be felt directly — think of the movements in Cochabamba winning the Bolivian water wars, for instance. It’s worth noting that some of these ideas are already informing struggles elsewhere, like Save Greek Water, the anti-privatization campaign in Athens. Of course we shouldn’t read too much into the Italian experiment. While the grassroots processes look promising, the Italian left is still — as everywhere else — fighting a defensive battle against an overwhelming neoliberal offensive. Still, it seems to me that there is an important message here: perhaps one way to overcome the paralysis in which many movements now find themselves would be to start crafting a much clearer vision of where we actually want to go. Some will call this vision anarchism, others may call it socialism or communism, and most people probably don’t want to give it any name at all. But until we start translating these contested concepts into concrete objectives that can actually bring us together, rather than dogmatic abstractions that continue to tear us apart, that may just be a helpful first step in overcoming our countless differences, broadening our political horizons, and regaining a sense of direction for the tough years that lie ahead. Jerome Roos is a PhD candidate in International Political Economy at the European University Institute and founding editor of ROAR Magazine. Posted on May 2, 2014, in Economical Crisis, Europe and tagged Italy, social movements. Bookmark the permalink. 1 Comment. Reblogged this on we are not afraid of ruins.